We’ve had a great time making the Titanium module available for Geoloqi. As we move forward towards the next version of the Geoloqi platform, we’ve decided to consolidate our efforts around native SDKs and apps. We really enjoyed having a module for Titanium, but having a third SDK to maintain, develop and support takes our efforts away from providing the best SDKs for our iOS and Android. Although this may be disappointing news to some of you, we want to ensure the best quality of product possible, and ensuring that our SDKs work best on iOS and Android native applications is our first goal. As of this time, the Geoloqi module for Titanium has been removed from the Titanium marketplace, and starting July 2013, we will no longer be supporting Geoloqi for Titanium. If you have an existing application built with the Geoloqi module for Titanium, you’ll be able to continue using it until Dec 2014. We will continue providing support to non-enterprise customers through July 2013 and to our paying customers who are using the Titanium module through December 2014. We’ll be releasing a new version of the Geotrigger platform and SDKs through http://developers.arcgis.com in June that will be available for native iOS and Android developers. Update: Titanium Modules Now Open Source! Due to interest, we wanted to make sure our community could still develop with the Titanium module. Below are links to the source code for the Geoloqi iPhone and Android Titanium Modules. Important! This code was not developed in house at Geoloqi, and is no longer supported by us. Due to time restrictions, we won’t be able to answer questions about this code. This code has been released under the Apache license. 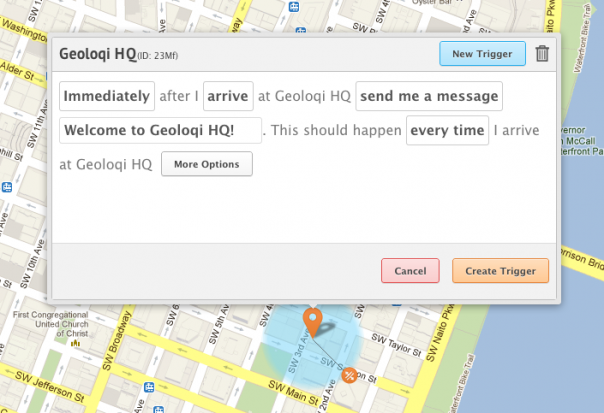 Unleash the Next Generation of Location with Geoloqi for Titanium! My co-founder, Aaron Parecki, and I share a belief: Things happen in places. We all carry around incredibly powerful mobile phones in our pockets, and we spend all our time interacting with them and not with the world around us. We believe that location services should be an invisible trigger for actions that take place on the device or in the cloud. Aaron and I set out to start a company that would help developers create calm applications that recede into the background and only present themselves to users when they have contextually relevant actions or information to share. Our hope is to get people to look up from their screens and go about their daily lives. The reality is that building a location service within an application is complex and time-consuming. You have to figure out how the different mobile platforms handle location features, how you’ll enable push-messaging in these different environments, how to set up a system for storing the geodata, how to create a method for tracking and analyzing the data, and, most importantly, how to make your location app accurate without draining the phone’s battery. 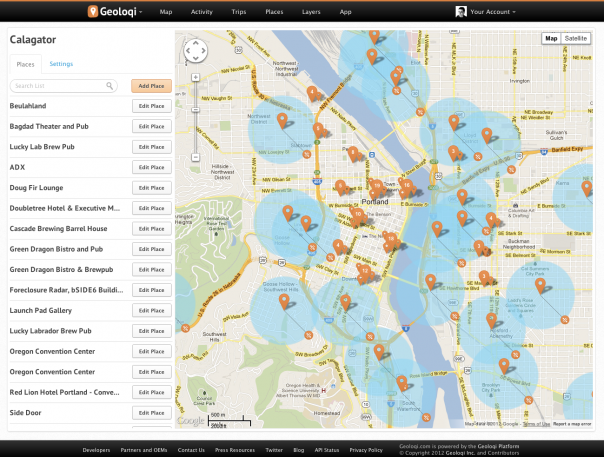 We founded Geoloqi to hide all the complexity of developing a location service “under the hood”. 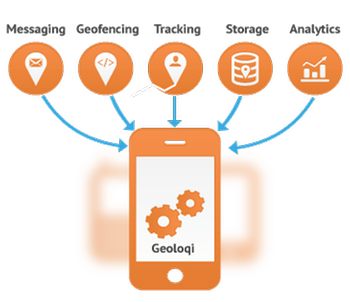 Geoloqi has published a robust, next-generation, location-based platform that makes it easy for developers to add location context within their mobile apps. One of the primary problems with location-tracking apps today is that they have a tendency to drain smartphones’ batteries by always running the GPS in the background, or constantly pinging cell towers. Geoloqi uses algorithms that know when to turn the GPS on and off, which preserves battery life. For example, if your app is using a geofence, it knows that the GPS doesn’t have to constantly be running unless the user is near that geofence. Another problem has been enabling individualized geotriggers. Unlike first-generation location services that use geofences as filters to determine which group of users to send a broadcast message to, our advanced platform allows your application to push messages and execute events to a single end-user at the moment they cross into a geofence, dwell within it, or depart the zone. Imagine a large retail chain that is able to push their (opted in) loyal customers a message as they enter the store, not only welcoming them to the store by name and providing them with loyalty points for their visit, but also integrated into the chain’s CRM system to allow the app to mention that their favorite item is on sale that day. Imagine a hotel chain that automatically recognizes that a patron has pulled into their parking lot, automatically checks the user into the hotel, and has their room key and paperwork waiting at the front desk by the time they walk in from the lot. Alert users to nearby deals by sending them a push notifications when they are within a few blocks of an offer! Use an existing database of offers or use the Geoloqi visual trigger editor to create custom ones. Or, use Geoloqi to give virtual currency for their favorite mobile game if they visit the a venue or store. Tourism boards can create location-based tours of historical information that will send messages to users about points of interest as they travel around a city or state. Trigger a home automation system to turn the lights on when a person gets home, and automatically turn off when one leaves. The Geoloqi Titanium module enables persistent/ambient background location tracking, intelligent battery management, and transitions smoothly between location sources such as carrier signals, GPS and Wifi for true real-time tracking. It also provides rich location and dwell-time analytics, giving your clients the ability to analyze and take action on location data. At Geoloqi, we are excited to give you the tools to easily make location services that are present when your user needs them and invisible when they don’t. Two free months of Geoloqi when you sign up today! Thanks to Appcelerator’s sponsorship, if you download the Geoloqi Titanium module before June 30th you can try it for free for two months, and experience how Geoloqi takes care of the hard parts of geo for you. Geoloqi CTO Aaron Parecki and Appcelerator CTO Nolan Wright will be doing a webinar at 11Am PST on May 29th, 2012. Check out Appcelerator for details or register for the Webinar directly. You can also follow @geoloqi on Twitter.